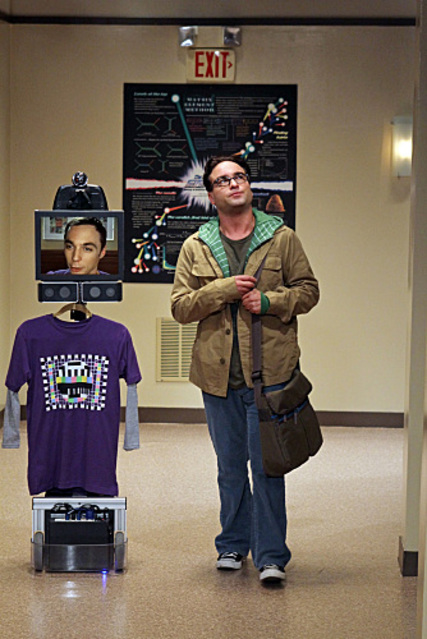 A couple of months ago, my College’s IT department invested in several “telepresence devices”: rolling robot-type gizmos with iPads on top, of the sort that most of us probably have only seen on a legendary episode of “The Big Bang Theory.” I dismissed the purchase as a curious end-of-year exuberance; nothing to do with me and my work. But yesterday, I sat shooting the breeze with a few of our instructional technology types while they were setting up my new laptop. And I realized how this innovation might be used in the near future to supplant the weekly drives that many of my colleagues and I make “down the mountain” to teach the several off-campus graduate cohorts that have been a core part of our mission for years. As in: you can earn an Ed.D. at my institution, in Boone NC, by attending classes at campuses in Winston-Salem or Hickory, 90 minutes away – classes that have heretofore been held by professors that showed up after making the drive both ways in one of the fleet cars the university maintains. A wildly inefficient way to do anything, especially in an age when Skype and virtual interactive spaces are pushing the questions of what it means to “learn something from someone.” It would be a heck of a lot cheaper, and save wear and tear on both the aging fleet cars and the aging faculty who drive them, if we could find a better way. So: isn’t it more efficient to tele-teach such seminars, rather than schlepping our bags of meat up and down route 421? To be clear: I do not know for a fact that anyone upstairs is considering this nefarious scheme. Really, they would be foolish not to, since we are a public university in a state that seems to be leading the country in its redefinition of what it means to support a public university system. Doing more with less – and less and less – is the way we do business nowadays. And I am not even sure the scheme would be nefarious, if it were being cooked up. I do not think technology in education is inherently nefarious. I am convinced that some of its innovations really move us into new and productive places – like the “flipped classroom” vogue we are currently experiencing, which is an excellent corrective to lazy, talk-at-the-room-because-they-can’t-leave pedagogy when implemented thoughtfully. But the specter of a telepresence professor “teaching” a room full of flesh-and-blood students from an office eighty miles away demands consideration. It’s drone-pilot teaching – and we’re just starting to reckon with the implications of doing remotely what we previously could only do face-to-face. If it makes us uncomfortable – why? If we feel we are losing something if we go this way – well, what? It’s incumbent upon those of us who feel something is being lost to articulate that “what,” as clearly as we can. I wonder if my unease has something in common with music – particularly, the way that recorded and reproduced music remains the palest simulacrum of the performed-and-heard-live event. Donald Fagen’s memoir last year left a lot of folks befuddled, because of its tremendous, almost misanthropic crankiness (a taste of the critics: “Mr. Fagen has changed from an alienated suburban kid, a subterranean in gestation with a real nasty case of otherness, into somebody’s crabby Uncle Morty”). Everyone knew he was a perfectionist, but who anticipated passages like this? A lot of things really cheese Donald off: bad hotel pools, indifferent room service, and damp dressing rooms among them. But his most withering criticism is reserved for poor acoustics, in all its iterations. The Orpheum in Vancouver is home to the Vancouver Symphony Orchestra. For all I know, the orchestra sounds spectacular in this place. But, as is the case with many old symphony halls, when you are playing electric music at pretty high volume, you might as well be playing in an airplane hanger. If there’s a sonic hell, the entrance is somewhere on the stage of the Orpheum in Vancouver (p. 109). He was heading for the jazz clubs, still cooking in his formative years, where he got a schooling in what it was to make music for real, live, right now. And no quantity of forced in-ear monitors or slapback from the far side of a basketball arena can blunt his still-keen memory of the experience. I remember seeing the mighty Count Basie band at a matinee at Birdland, with the great Sonny Payne on drums. When the whole band pumped out one of those thirteenth chords, you could feel the breeze on your face (p. 48). One of my favorites was bassist / composer Charles Mingus, who would always bring along his demonic drummer, Dannie Richmond. Every time Richmond started banging out that triple time, the vibration of his sizzle cymbal would move my glass towards the edge of the table and I would have to push it back to the center. (p. 49). Having been around the real deal – having had the power of extraordinary live music pour into his heart, and stop it cold – he’s ruined for the mp3 compression, or crummy little earbuds, or blasting away at a keyboard in a music hall that might as well be a big coffee can. He’s been around real people doing this thing, and he can’t pretend that technologies that separate “the musician from his labor” do anything but unravel the alchemic synthesis of human and instrument and mind and heart that music really is. Is it too much of a stretch to claim that a similar transaction is happening in a powerfully-taught classroom? That there is something ineffably somatic about learning; something about bodies sharing space and air and time in a live, never-repeated moment that is a crucial part of the experience? Maybe one that is not missed until it is gone, dissolved into a virtual experience that, for all its fidelity, still falls into an uncanny valley of being less and less like the real thing? I remember little about Mrs. Otis’ sixth-grade class at Ridge Mills Elementary except her monologues about her trip to then-Soviet Russia; how they affirmed her deep convictions that commitment to American democracy was the only defense against the tyranny of totalitarianism. As an adult, I can quibble with her politics; as a child, I was transfixed by the specter of how another adult – not my parents – looked and felt when she was deeply moved, deeply frightened, deeply hopeful. She was one of the first grown-ups I saw fully enthralled by something bigger than she was. I remember Dean Edgar Beckham teaching me the Iliad as a freshman; the way he settled into the lines he had taught to forty years of new college students like they were a well-worn leather armchair. Showing us how Achilles’ strength was undermined by his childishness; how Agamemnon’s pride would end all he had worked for and served heretofore. Dean Beckham didn’t just teach me literature: he taught me how to live with literature, how it had seeped into his body and enriched and colored his engagement with his world. I remember Dr. Enda Duffy talking quickly about something called “postmodernism” in his dancing Irish voice – and prisons, and television, and surveillance, and God knows what else. Right there, eight feet from me – I remember becoming aware how fast his mind was working with ideas and problems I barely knew existed, and discovering that if I just did the reading before class and listened as hard as I could something would begin to come together, even if only contours and shapes. Shapes that have contained everything I have learned since. These weren’t Dead Poets’ Society-style performances: none of the teachers I am remembering were show people, intent on singing and dancing their curriculum into my heart. I am remembering more the unspoken lessons about how what we know changes us, and how our commitment to engaging worthy ideas and art give us something to live for. I don’t think I could have had these experiences if any of these teachers were disembodied faces on an iPad above a set of wheels. It has nothing to do with the level or quality of their voices (I do not know, in fact, if one can mute a telepresence device if one is tired of listening to it). It has to do with witnessing someone’s consecration to something; the way that a great teacher’s relationship to ideas, or logics, or beauty or answers, makes that teacher more than she was without it. And it’s a live performance. I learned so much more than “content” from my teachers: I learned a way of being in relation to myself, and to the world I was being prepared to join. Witnessing someone older and wiser than I share this sacred, life-giving relationship with me had to happen in the flesh. I might have missed it if it were just another feed on another screen that I could choose to minimize if something else seemed more interesting to me in the moment. History teaches that the gatekeepers of culture are usually slow to acknowledge the value of technologies that threaten their place in the social order (mass-produced books threatened those who could read, etc). I am aware that my defense of face-to-face teaching, even at a cost, might just be self-serving. Or maybe I am subconsciously defending the tiny stipend I get to make that drive every week? Battle Royales in academia have been waged over less! But I don’t think so. In age when the value of everything we do in schools is reckoned according to oversimplified, quantifiable, comparable outcomes, it becomes even more urgent to interrupt the common-sense way of talking about efficiency with truths that are still true. Scholarly curiosity matters; critical engagement matters; erudition matters. We learn the value of these things by witnessing others who have developed them, and some part of that learning is as mimetic as a baby’s learning to make faces, smile, and laugh by watching his caregiver. When my son sleeps on my chest at night, he is learning how to have a body from mine. When we share space and time and air with our students, as scholars, in some way we are giving them a similar structure within which to grow and become who they are going to become. And that’s all I can say about it right now: my seven month-old son’s body is demanding some physical – not virtual – presence. Love to hear what Gentle Reader thinks of all this! Albeit virtually, in the comments. Note: my original post described the telepresence device purchase in the first paragraph as an “excess.” I misspoke: nothing about our University or College budget is excessive these days. Screen grab from “The Big Bang Theory” linked from Hizook, with gratitude.